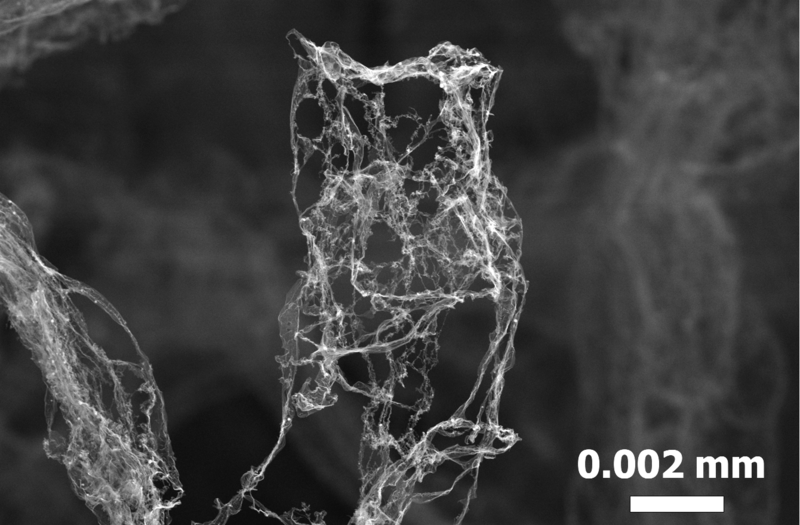 A network of porous carbon tubes that is three-dimensionally interwoven at nano and micro level – this is the lightest material in the world. It weights only 0.2 milligrams per cubic centimetre, and is therefore 75 times lighter than Styrofoam, but it is very strong nevertheless. Scientists of Kiel University (KU) and Hamburg University of Technology (TUHH) have named their joint creation “Aerographite”. The scientific results were published as the title story in the scientific journal “Advanced Materials” on July, 3rd. Today (Tuesday, July 17th) it is presented to the public. It is jet-black, remains stable, is electrically conductive, ductile and non-transparent. With these unique properties and its very low density the carbon-made material “Aerographite“ clearly outperformes all similar materials. „Our work is causing great discussions in the scientific community. Aerographite weights four times less than world-record-holder up to now”, says Matthias Mecklenburg, co-author and Ph.D. student at the TUHH. 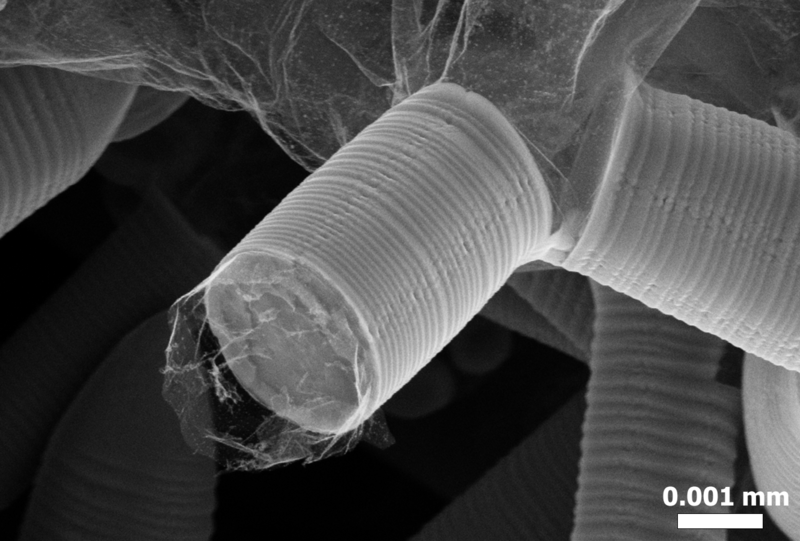 The hitherto lightest material of the world, a nickel material that was presented to the public about six months ago, is also constructed of tiny tubes. Only, nickel has a higher atomic mass than carbon. “Also, we are able to produce tubes with porous walls. That makes them extremely light”, adds Arnim Schuchard, co-author and Ph.D. student at Kiel University. Professor Lorenz Kienle and Dr. Andriy Lotnyk were able to decode the material’s atomic structure with the aid of a transmission electron microscope (TEM). Despite of its low weight Aerographite is highly resilient. While lightweight materials normally withstand compression but not tension, Aerographite features both: an excellent compression and tension load. It is able to be compressed up to 95 percent and be pulled back to its original form without any damage, says professor Rainer Adelung of Kiel University. “Up to a certain point the Aerographite will become even more solid and therefore stronger than before”, he points out. Other materials become weaker and less stable when exposed to such stress. “Also, the newly constructed material absorbs light rays almost completely. 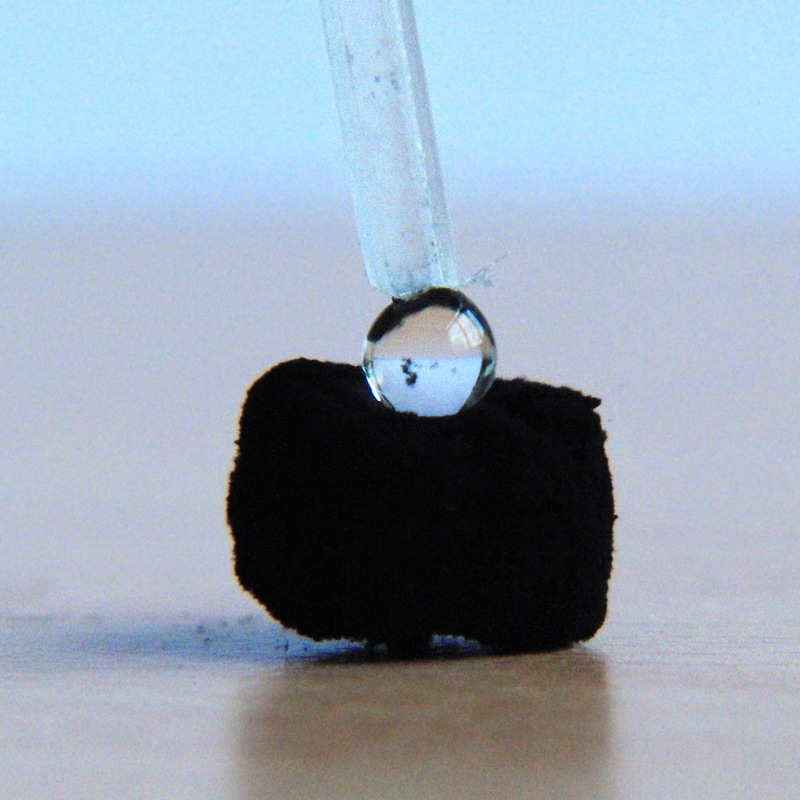 One could say it creates the blackest black”, acknowledges Hamburg’s Professor Karl Schulte. “Think of the Aerographite as an ivy-web, which winds itself around a tree. And than take away the tree”, Adelung describes the construction process. The “tree” is a so-called sacrificial template, a means to an end. 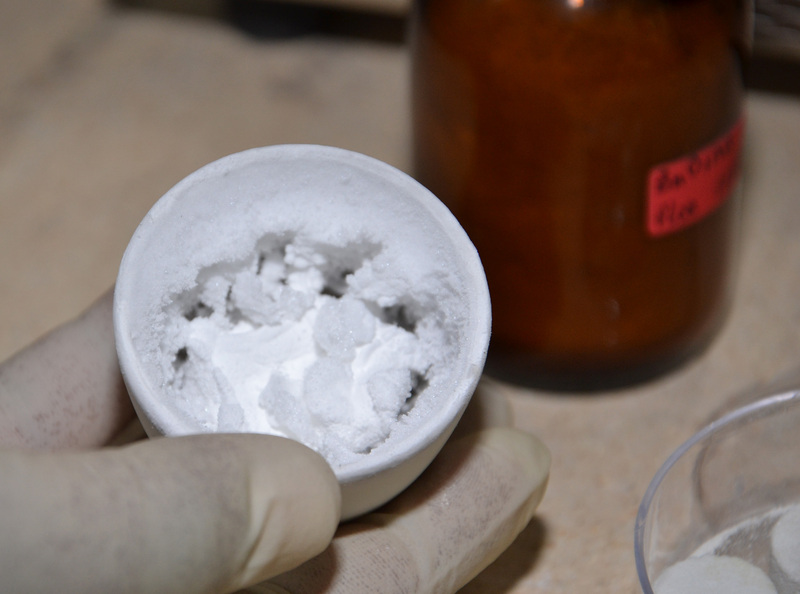 The Kiel-team, consisting of Arnim Schuchardt, Rainer Adelung, Yogendra Mishra and Sören Kaps, used a zinc oxide in powder form. 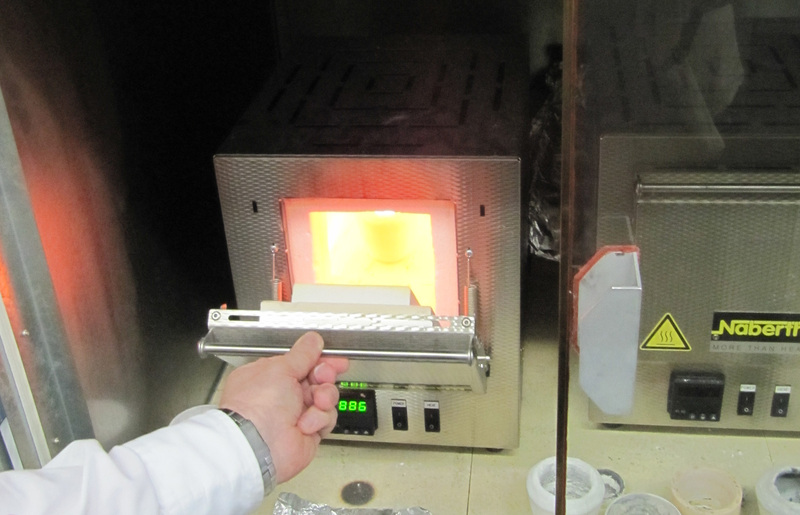 By heating this up to 900 degrees Celsius, it was transformed into a crystalline form. 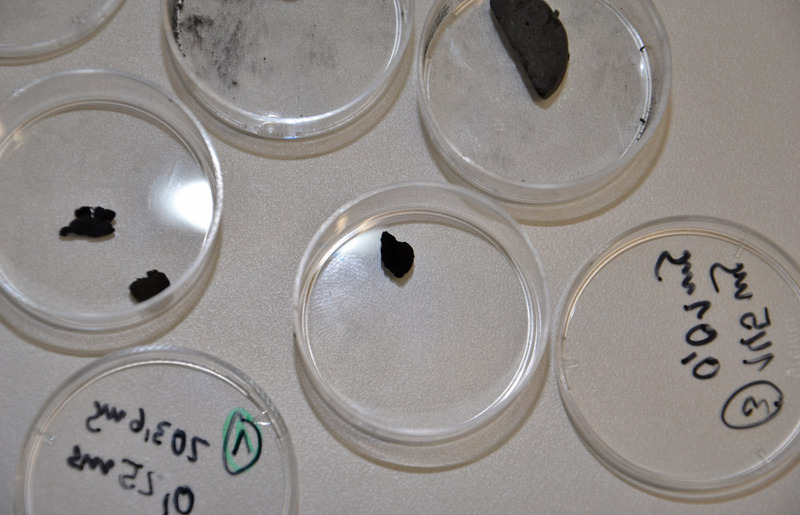 From this material, the scientists from Kiel made a kind of pill. In it, the zinc-oxide formed micro and nano structues, so called tetrapods (illustration # 4). These interweave and construct a stable entity of particles that form the porous pill. In that way, the tetrapods produce the network that is the basis for Aerographite. Due to its unique material characteristics, Aerographite could fit onto the electrodes of Li-ion batteries. In that case, only a minimal amount of battery electrolyte would be necessary, which then would lead to an important reduction in the battery’s weight. This purpose was sketched by the authors in a recently published article. Areas of application for these small batteries might be electronic cars or e-bikes. Thus, the material contributes to the development of green means of transportation. 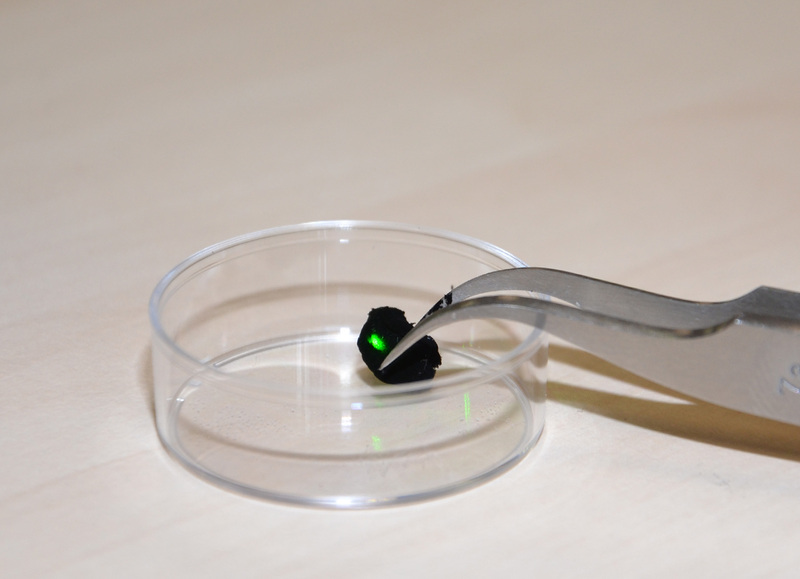 According to the scientists, further areas of application could be the electrical conductivity of synthetic materials. 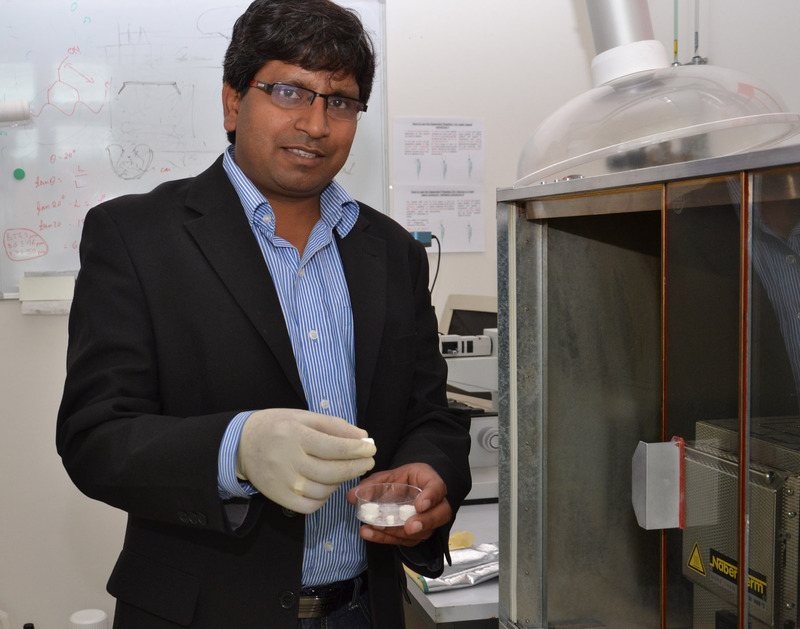 Non-conductive plastic could be transformed, without causing it to gain weight. Statics, which occur to most people daily, could hence be avoided. The number of further possible areas of application for the lightest material in the world is limitless. After officially acknowledging Aerographite, scientists of various research areas were bursting with ideas. One possibility might be the use in electronics for aviation and satellites because they have to endure high amounts of vibration. Also, the material might be a promising aid in water purification. It might act as an adsorbent for persistent water pollutants for it could oxidise or decompose and remove these. Here, scientists would benefit from Aerographite’s advantages namely mechanical stability, electronic conductivity and a large surface. Another possibility might be the purification of ambient air for incubators or ventilation. Caption: This graphic shows a detail of the world’s lightest material: Aerographite. Open carbon tubes form a fine mesh and offer a low density of 0.2 milligram per cubic centimetre. 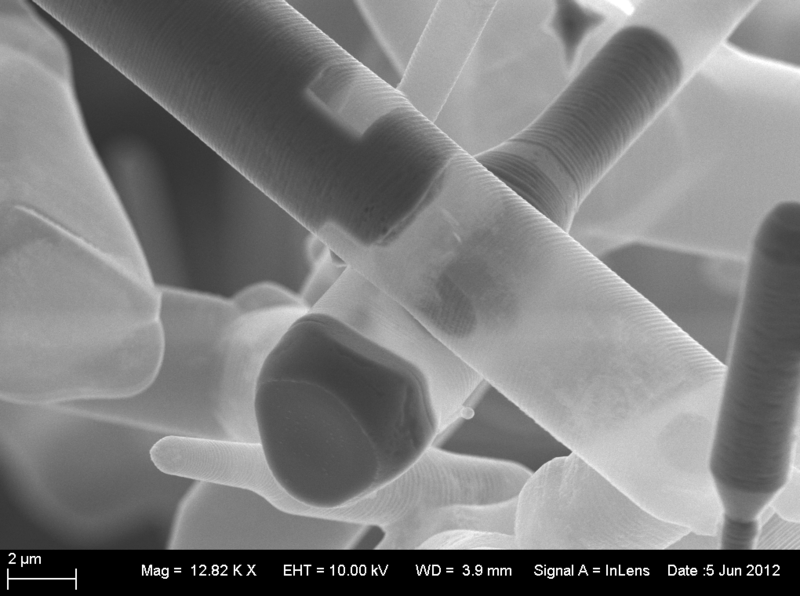 The picture was taken with a scanning electron microscope (TEM). Caption: The reactor is heated up to more than 760 degree Celsius. Gaseous zinc and steam leak out. At the image: in the dark areas there is still zinc oxide recognisable. What remains is a graphite shell (light areas). Caption: During the building process, the so-called sacrificial template, a crystallised zinc oxide (white), is “sacrificed” when hydrogen is given into the process. Steam and Zinc leak out, the tubes of Aerographite remain. 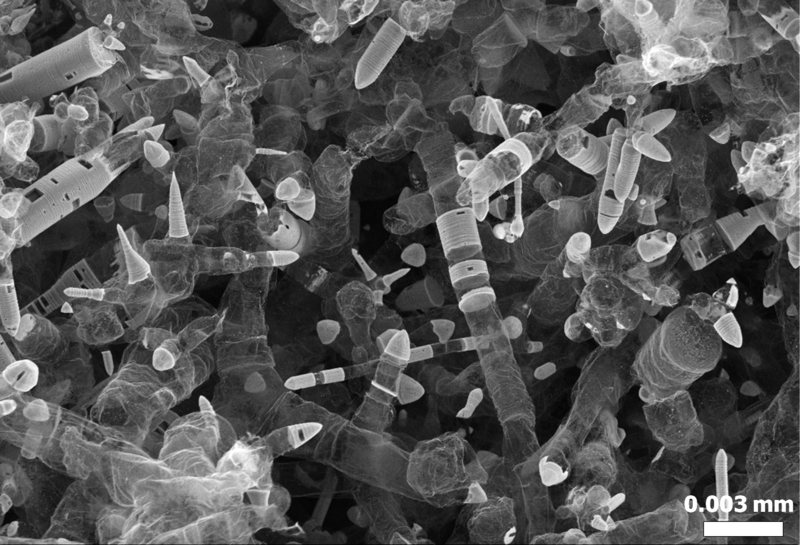 Caption: The tetrapods of the zinc oxide form an ideal basis for the robust material Aerographite. Caption: An Aerographite in the making. It offers enormous potentials – e.g. for the production of batteries. Caption: Aerographite is water-repellent, jet-black (which is currently analysed) and electrically conductive. Video: Aerographite can be compressed up to 95 percent and be pulled back to its original form. In contrast to other materials, it thereby just becomes stiffer (Diameter nine millimetres). Video: The very small masses of the Aerographite allow quick changes of direction. It raises itself in an erect position, jumps onto the plastic pole and back onto the table: In that way Aerographite gets electric charge from the pole and emits it to the table. 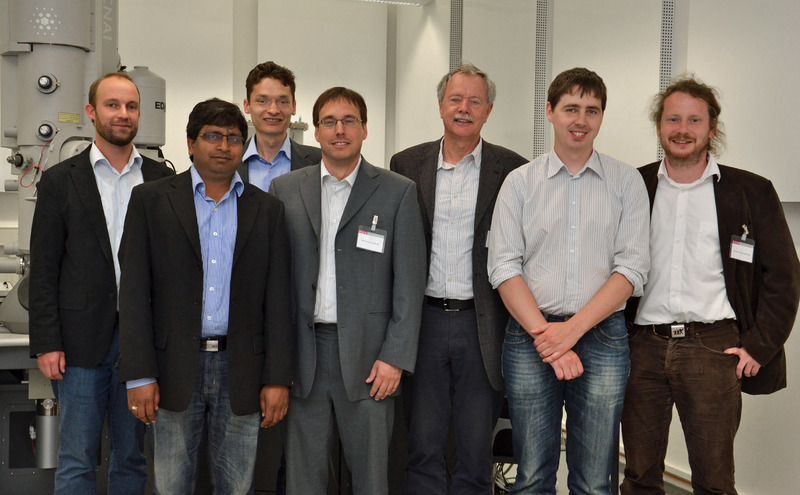 Caption: The proud authors of the Advanced Materials article (from left): Matthias Mecklenburg, Yogendra Kumar Mishra, Arnim Schurchardt, Lorenz Kienle, Karl Schulte, Sören Kaps, Rainer Adelung (not at the picture: co-author Andriy Lotnyk). Caption: Small crumb being big: the newly constructed material absorbs light rays, such as this green laser pointer, almost completely. 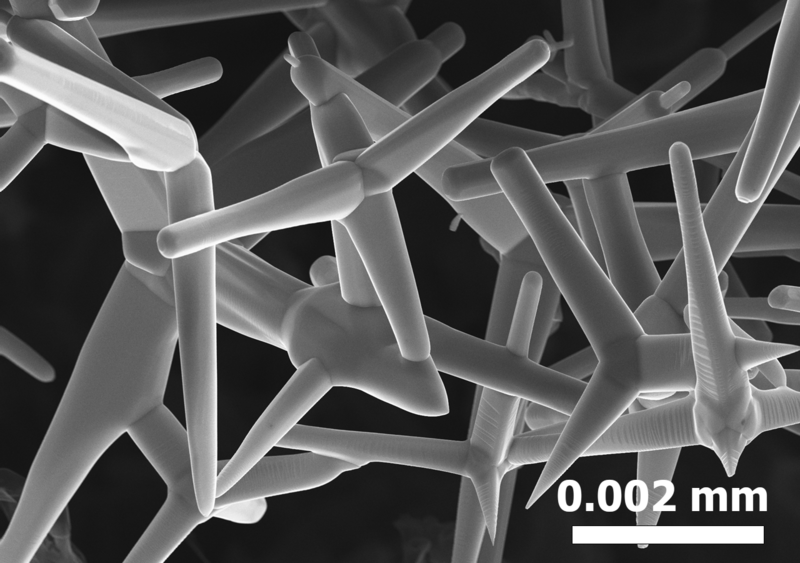 Caption: Simple but ingenious: the crystallised zinc oxide is the basis for Aerographite. Caption: The blackest black: Aerographite. 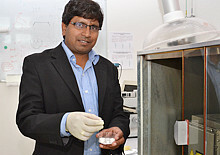 Caption: Yogendra Mishra shows the zinc oxide templates at the oven lab at Kiel University. Caption: It needs 900 degrees celsius to produce the zinc basis for Aerographite. 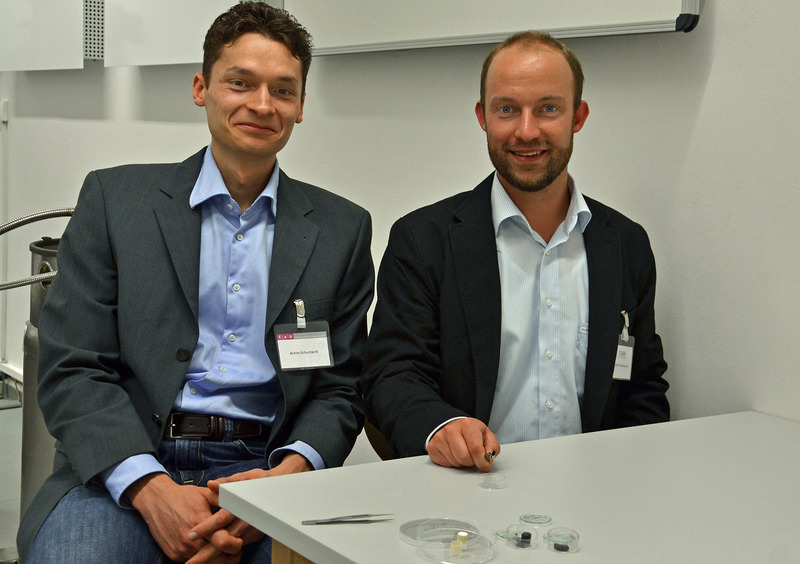 Caption: Ph.D. students on course: Arnim Schuchardt (left, KU) and Matthias Mecklenburg (TUHH) developed Aerographite together with their Hamburger and Kiel colleagues.